Tyler Hanck ’13 of University of Illinois at Chicago delivers first lecture of fall series. 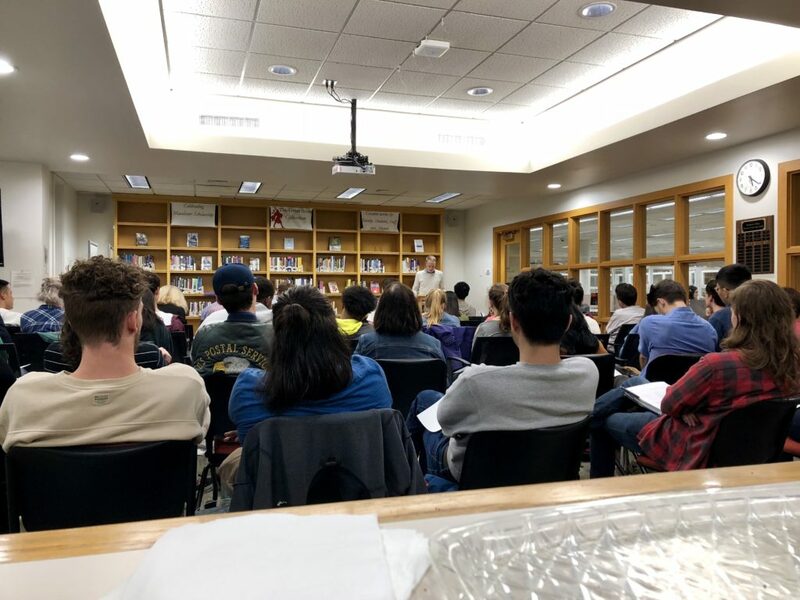 Each semester, the Philosophy Department sponsors a series of lectures by philosophers from colleges and universities around the country. Check back here for more updates as the semester continues. Robert Audi, Professor of Philosophy at Notre Dame 2013-14 Henry West Speaker. Justin Jeffrey, Professor of Philosophy University of St. Thomas will give a talk titled “Normative Transference.” Justin Jeffrey earned his PhD in Philosophy from the University of North Carolina at Chapel Hill in 2007 with a concentration in metaethics. His research interests are primarily in metaethics and epistemology and the intersection of the two. “Divine Laws,Divine Decrees, and the Order of Nature” Car 06 4:40. He will explore the relation between God and the laws of nature in a number of key figures of the 17th century. Dale Jamieson, a professor of Environmental Studies and Philosophy at New York University, will present a talk titled “The Invention of Practical Ethics” in 06a in Carnegie Hall at 4:45 pm. He will examine the history and beginning of practical ethics. Dr. Tristram McPherson from the University of Minnesota Duluth presented a talk titled “Moral Attitudes for Expressivists: Solving the Specification Problem,” in Carnegie 06 at 4:40 pm. The Annual Engel-Morgan-Jardetzky. John B. Davis Lecture Hall, 8:00pm. This year’s speaker will be Michael Meaney. He is a professor at McGill University specializing in biological psychiatry, neurology and neurosurgery who is primarily known for his research on stress, maternal care and gene expression. Lecture by Prof. Adam Briggle. Old Main 4th Floor, 4:30pm. Dr. Briggle is a professor at University of North Texas. His research interests include ethics of science and technology, enviromental studies, bioethics, and ethics and culture of new media. Dr. Brighous is a professor of philosophy at University of Wisconsin-Madison. His research interests include theoretical foundations of liberalism, the aims of education, reforms in education, the theory of justice, and more. Prof. Emily Esch will present a talk titled “Making Sense of Our Selves” in Carnegie 06A at 4:30. Dr. Esch is a professor at College of Saint Benedict and St. John’s University. Her teaching and research interests include philosophy of mind, epistemolgy, experimental philosophy, and philosophy of science. Henry West presented a talk titled “Value Realism and Moral Constructivism” in Carniegie 06 at 4:30. Katherine Brading presented a talk titled “Epistemic Structural Realism and Poincaré’s Philosophy of Science” at 11:30 AM in Carnegie 06. University of Minnesota Professor Valerie Tiberius will present a talk entitled “Wisdom and Work” at 4:40 PM in Old Main 111. Keynote Presentation: “Philosophers, Readers, Writers” by Eugene Garver, Regents Professor of Philosophy, of St. John’s University. Buffalo State College Professor Julian C. Cole will present a lecture entitled “Mathematics: Plentiful Province or Dependent Dominion?” 4:30 PM, Old Main 111. All are welcome. Rutgers University Professor Stephen Stich will give a presentation entitled “Experimental Philosophy & the Persistence of Moral Disagreement.” 4:30 PM, Canegie 06. All are welcome. Duke University Professor Allen Buchanan will present a lecture entitled “Human Nature & Enhancement.” 4:30 PM, Carnegie 06. All are welcome. Trinity College Professor James Hughes will present the 2007-08 Jardetzky lecture entitled “Manimals, Cyborgs, and Gattaca: the Biopolitics of Human Enhancement Technologies.” 8:00 PM, John B. Davis Lecture Hall. All are welcome. Boston University Professor of Philosophy and Law David Lyons will give a lecture entitled “Race and the Rule of Law” at 4:30 PM, John B. Davis Lecture Hall. All are welcome. College of William & Mary Professor of Philosophy, Emeritus Alan Fuchs will give a lecture entitled “Mill’s One Very Simple Pirinciple of Liberty” at 4:30 PM in the John B. Davis Lecture Hall. All are welcome. Macalester’s own Professor of Philosophy, Karen Warren, will give a presentation titled “Why does Traditional Philosophy need Feminism?” at 4:30 PM in the John B. Davis lecture Hall. All are welcome. Daniel Dennett, Professor of Philosophy and Co-Director of the Center for Cognitive Studies at Tufts University, will give the 2007-08 Jardetzky lecture entitled “Darwin, Reason, and Creativity.” 8:00 PM, John B. Davis Lecture Hall. All are welcome.